Facebook video ads allow for more creativity than static image ads. Videos can be short, eye-catching ads that are just a few seconds to informational videos lasting up to 45 minutes. 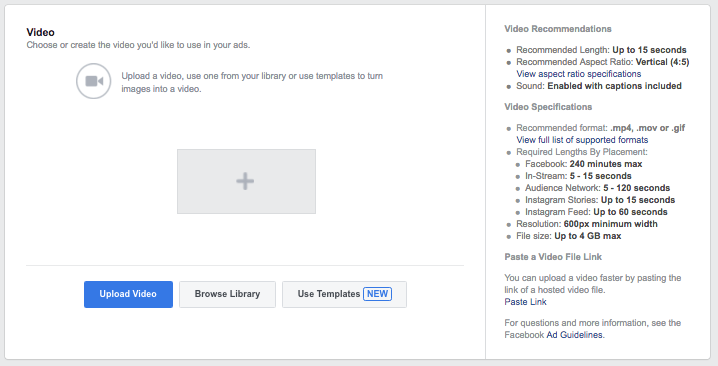 Videos are uploaded in Facebook Ads Manager during the campaign creation process. Video ads are a good way to better engage your target audience. Creating a video ad on Facebook Ads Manager is a straightforward process, however, video ads are more complex than image ads. Businesses lacking the time and/or in-house expertise should use a professional Facebook ad management service such as Hibu. 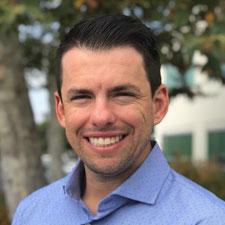 Hibu can help drive a higher return on ad spend and more sales. Facebook video ads work a lot like Facebook image ads, with videos in place of images. First, advertisers will need to design and create the video for their ad. 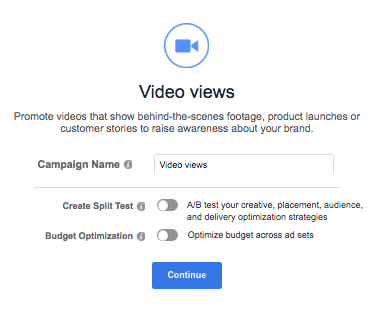 Then, video ads can be created in Facebook Ads Manager as a new campaign, uploading your video and then choosing targeting parameters like a normal campaign. Once launched, video ads will be displayed to your selected audience in their news feed. Video ads utilize a combination of media and copy, including a headline, body text, and link description (or call to action). Advertisers have the choice of which ad-type they want to use for their video ad, depending on their advertising goals and how many videos they want to include in their ad. For example, an online retailer looking to increase sales on mobile would use Collection ads, which are designed for mobile e-commerce ads, whereas an indoor rock climbing gym may use a single video ad to build awareness. Facebook Ads Manager is where advertisers create and launch Facebook ads. Ads Manager is Facebook’s advertising platform that makes it easy to create ad campaigns, including video ads, and it walks you through the setup process. Once a video ad is live, it automatically plays the video when the ad is displayed. The auto-play capability drives more awareness as moving objects draw users attention more easily than images, ultimately reaching advertising goals faster. Video ads may be better suited for some advertisers than others. Whether they’re right for your business will depend on what you are advertising, your advertising goals, and your ability (or budget) to produce a video. Videos can say a lot more than an image, ultimately making them good for those looking to tell a story with their ad, as opposed to one concise message. Want to Illustrate a Story – Videos can literally tell a story, giving advertisers the opportunity to say more within one ad. Have Professional-Level Facebook Ad Management – Videos need to be professional quality in terms of messaging, design, and production. Advertisers Who Want to Use Sophisticated Retargeting – Video ads give advertisers a way to create a custom audience that can be used for retargeting ads to warm leads. It’s important to note that costs aren’t the only major factor in whether a business should use Facebook video ads. Even with a budget that can easily afford professional video design and product, businesses should consider whether a video ad would be a more effective way of conveying their message and if that will lead to reaching your advertising goals. No matter which media type you choose for your Facebook ads, you will want to understand how to set up ads so that they reach the right people. Understanding how to create target audiences is key for any Facebook ad. To help make it easy to understand all of the Facebook ad targeting options, we’ve narrowed them down in our article Top Facebook Ad Targeting Options. Facebook video ads with the marketing objective of video views are on a cost per 1,000 impressions, or CPM. Meaning, advertisers are charged when 1,000 people are shown their ad. Impressions do not mean that users watched your video in its entirety — only that the ad was present on their screen. CPMs, like cost per click (CPCs), vary greatly depending on a number of factors from competition level to industry, but the average CPM is around $3 – $8. The decision to use CPM ads versus CPC ads will depend on a business’ overall advertising strategy. 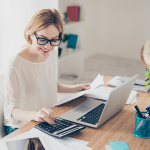 You can learn more about both types of ads as well as Facebook advertising costs including industry benchmarks, CPC comparisons and how to estimate your return on ad spend in our article Facebook Advertising Costs by Industry. Facebook video ad specs vary by ad type. It is important to not only choose the ad-type that best fits your advertising goal, but also to adhere to Facebook video ad specs in order to create effective video ads. Single Video Ads – The ad includes one video. Carousel Ads – The ad can feature 2- 10 videos in one ad. Collection Ads – For e-commerce businesses to promote their product catalog. Each ad type has different ad specs and following Facebook’s ad specs is the foundation for great ads. Get the exact details of video ad specs from supported file types, thumbnail sizes, and required resolution in our article Complete List of Facebook Ad Specs. Once you have a plan in place for your Facebook ad’s objective and design, you are ready to begin creating the video ad. Depending on your ad’s vision you will likely be faced with the choice between sourcing an existing video through stock videos or hiring professionals to develop your video. Producing a professional-quality video is not enough to yield a Facebook ad effective. Before you can begin producing a video you need to first determine your campaign’s goal, and then build messaging and media that will speak to your target audience. Determine Your Campaign’s Advertising Goal – Figure out exactly what you want out of your ad spend such as building awareness and online sales to event attendance. 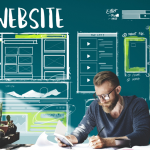 Choose Your Ad’s Call to Action – Every ad needs a call to action, or CTA, so determine which CTA is best for reaching your advertising goal. Clearly Define Your Target Audience – Pinpoint who exactly you are looking to reach with this ad. Choose Your Ad’s Message/Story – Find the story that will best resonate with your target audience. Discover the Best Way to Convey Your Story in a Video – Find a way to present your ad’s message in a powerful way with video. Once you have your plan laid out, it’s time to begin creating the video you will use for your ad. There are different ways of creating a video from using stock videos to hiring a production team to produce your custom video. Where you will source your video from will depend on the goals and design of your video. There are thousands of great stock videos available with prices that range from free to over a couple hundred dollars. Stock videos are a great option as they are very cost-effective and save a lot of time. Businesses in the service industry are particularly great candidates for using stock videos. It’s worth searching for a stock video before pursuing a custom-made video. Sites such as Pond 5 is a good place to start. For example, a mobile dog grooming business is looking to advertise their Spring Cleaning sale, so they search the stock video website Pond 5 for “dog grooming,” which provides over 3,000 different videos related to dog grooming. When there aren’t any stock videos that will effectively tell your story and resonate with your target audience, then you need to produce your own custom video. Most businesses aren’t capable of producing their own professional-quality animated media, so they hire others to produce it for them. Businesses that will most likely need to produce a custom video are those with branded products, such as a private clothing label. To find a professional to produce your video, start by searching for advertising production companies near you. Alternatively, a more budget-friendly way would be to use Fiverr to source a freelancer who is a video production pro. Fiverr is an especially great option for those interested in illustrated videos as they can be done remotely without using your products. A large majority of Facebook video ads include text overlays. Whether you were able to find a great stock video or produce your own custom video, you may still want to add text to make the video feel more like an ad. It is surprisingly easy to do this thanks to a number of free, user-friendly video editing platforms such as Biteable. Create your free account to start turning your videos into effective Facebook ads. Call out your audience’s pain points and putting the offer upfront before it gets cut off. Then include more about the offer and your business in the ad copy explaining why they should choose to spend their time with you. Video allows you to reach the most people for the least amount of money. I would recommend using video as much as you can. Once you have your video(s) ready to go, building and launching your new Facebook video ad is easy. Facebook Ads Manager walks you through the ad setup process, which is much the same as Facebook image ads. Launch your Facebook video ad and go live in 5 steps. Start by logging in to your Facebook Ads Manager account. 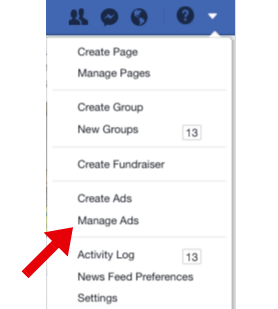 From your personal Facebook homepage, click the drop-down arrow in the upper right to view the menu, then select “Manage Ads”. If you don’t already have a Facebook Ads Manager account, you will need to first create one by visiting Facebook and completing the registration process. From your Facebook Ads Manager account, go to the campaigns tab (top center), then click the button labeled “+ Create”. Note that if you use your Facebook Ads Manager account to advertise multiple businesses, double-check that you are under the correct business account before creating the new campaign. Facebook will then begin walking you through the entire new campaign creation steps, starting with choosing your ad type and campaign objectives. Then, complete the pop-up box at the bottom of the page that appears after you click your objective. Remember that your chosen campaign’s objective will determine which ad types will be available to you in the next step. Tell Facebook who you want your ad to show to by running through all of the audience targeting options. Alternatively, if you have already saved a custom audience, and you wish to use that audience again, select that instead. 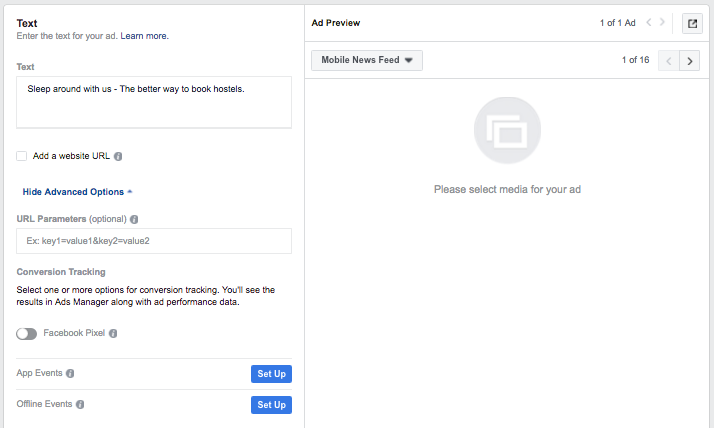 Continue through Facebook’s prompts to choose your ad placement, budget, and schedule. Next, you will be prompted to create your ad. This is where you will choose your ad type (i.e., single video, carousel, etc…), upload your video or videos, input all of your ad copy include your headline, body copy, and call to action. If there are any issues with your video’s size, file-type, or formatting, you will get an error message when you attempt to upload the video. Once you have completed all of the inputs, click confirm at the bottom of the page. Facebook video ads have their pros and cons. There is no one-size-fits-all answer to who should use Facebook video ads as it will depend on a number of factors such as your advertising budget, advertising goals, target audience, time, and level of strategy. More Effective – Videos tend to be more effective, as movement catches users’ eyes more than still images. Additional Insights – With videos you can see how long a user watched your video ad, allowing you to draw more insights from the added user behavior data. Retargeting – Advertisers can create custom audiences using the data from those who have watched varying amounts of the video ad, to present new ads tailored to them. Production Cost – Videos can be expensive to produce, making them difficult to afford for some small businesses without large budgets to allocate to Facebook. Production Time – Video ads can be time-consuming to design and produce. Potential Intrusiveness – Since video ads start automatically, they can be found annoying or even intrusive to users when they’re not targeted well. What constitutes a great Facebook ad is how well it speaks to your target audience, meaning a great Facebook video ad will look different from business to business. There are common elements between them that separate the good from the great. Don’t Depend on Audio – Many users will have sound turned off, so don’t create an ad that primarily relies on audio to send its message. Front Load Your Message – Your ad’s prime real estate is its first 5 seconds, so be sure to start the video strong by setting your main message or CTA to your video’s thumbnail and include any major selling points in the beginning and not end. Use Autoplay – When using CPM bidding your ads will automatically begin playing when they land on a user’s screen. Test Videos – Before paying to advertise your video, test ads on other social media channels or use the video organically. Analyze Video Data – Use the data from your videos to evaluate video performance and effectiveness. Retarget Video Ads – Show new ads to those engaged users who watched a certain percent of your video ad to capture a warm audience. How Long Can Video Ads Be? Facebook video ads can be up to 45 minutes long, but you’re most likely better off with a video no longer than one minute.Ideally, most videos should be around 15 – 30 seconds. Facebook offers a large number of ways to target ads. Every business will target their ads differently to create audiences that match their ideal customer. To learn more about the best Facebook targeting options, read our article on the Top 7 Facebook Ad Targeting Options. How Can I Use Facebook Video Ads to Retarget Ads? Facebook video ads present advertisers with a great opportunity to retarget by creating custom audiences based on who has watched your video. Advertisers can even create audiences based on how much of the video the user watched, to retarget not only warm but hot leads. Get more details about retargeting video ads in our article the Top 25 Facebook Advertising Tips from the Pros. Great Facebook video ads better reach target audiences by gaining their attention through messages that resonate with them on platforms they’re spending time on. It is important to take the time to understand your target audience before designing your ad to ensure it will speak to them and send the right message. Video ads can be highly effective when used strategically, so you are likely to see a higher return on investment from them. 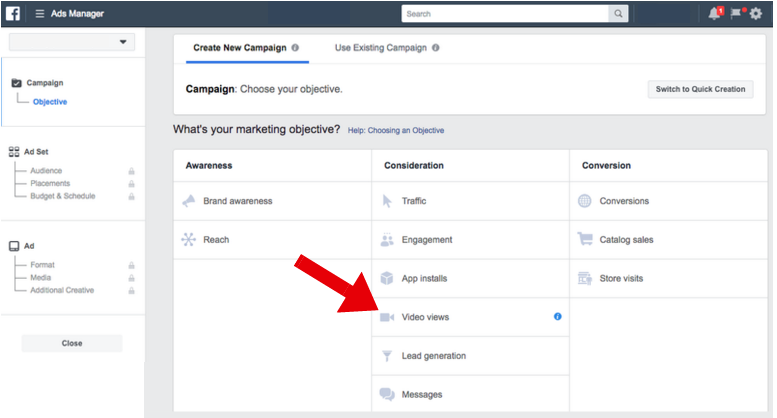 Creating and launching a video ad is one thing, but the day-to-day and month-to-month management of your Facebook ads may not be something you have the time (or Facebook expertise) for. Businesses, large and small, often use Facebook Ad management services, such as Hibu. Visit Hibu today to see how professional management and ongoing optimizations can help drive long-term success with Facebook advertising.